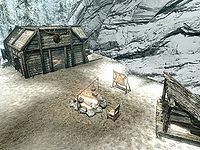 Angi's Camp is a cabin and camp southeast of Falkreath. Angi, a Nord ranger from Helgen, is the only occupant. She is in hiding due to her killing the two drunken Imperial soldiers who murdered her parents. Angi is very skilled with the bow and is willing to teach Archery for free through target practice competition. For each of six subtasks, you will gain one skill point in Archery, which is an easy way to train it. Mastering all six tasks additionally yields Angi's Bow, a unique non-enchanted hunting bow. For details on the archery training you can perform here, see this page. Getting to Angi's Camp can be difficult. It's high up in the mountains, and the marked paths there do not start close to the camp itself. Starting from Pinewatch, head south across the main road and onto a side road marked by stacked stones to the right of it. Follow this path to a pond, and head west from here along another side road until you reach a dead end. At this point, turn around and take the unmarked higher path, keeping the stacked stones to your left (two of them will have flags attached) until you reach yet another path. You'll soon reach a fork; the left path goes to a small hunting camp, while the right leads on. The main path comes to another fork after a while. Going straight will lead to Bloodlet Throne, while going right will finally lead to Angi's Camp (watch out for bear traps). 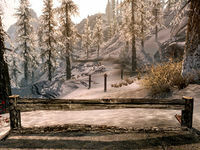 Alternately, start at Bloodlet Throne and head west along the road to reach the final intersection before Angi's Camp. The camp is really a shack with no front door and the windows are just holes with shutters. There is a fire pit outside to the west with a tanning rack by the fire and a lean-to full of firewood is behind it. There is a workbench outside to the right of the doorway against the side of the shack with a barrel and small set of empty shelves beside it. To the left of the doorway on the wall of the shack are three weapon racks together. There is a snowberry bush by the northern corner of the shack and a path heading north and down two flights of stairs to her archery range where she is willing to give you free lessons. The range is marked out with wood and has four targets at different distances. There is a second snowberry bush beside the range. Inside the shack on your left as you enter, against the northwest wall is a long wooden table and bench. On the table is a medium coin purse. In the northern corner is a barrel containing common ingredients and along the northeastern wall is a fire pit with a cooking pot over it. To the right against the same wall is a non-respawning cupboard. On the shelves are two sacks, a pair of farm boots and a set of fine clothes. There is a small bedroom to the right of this with the doorway (again no door) in the southeastern wall. There is a barrel and crate on your right as you enter the shack and to the left hanging from a roof strut is a garlic braid, a sample of elves ear and a sample of frost mirriam. In the bedroom area on your left as you enter is an unlocked chest containing leveled items. In the southern corner is a double bed and beside this a non-respawning end table which contains treasure map V, while on top is a copy of the Archery skill book The Gold Ribbon of Merit. This page was last modified on 27 September 2016, at 01:57.